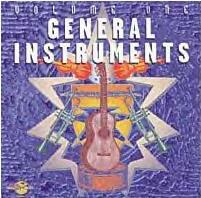 Rock and pop guitar strums, drumbeats, basslines, orchestral flute parts, cymbal rolls, strings lines, sax solos... General Instruments takes a broad look at instruments and playing styles that are notoriously difficult to recreate on a keyboard. String parts range from scrubbing cellos to classic orchestral runs, while the keyboard category includes both short piano embellishments (mordents, trills...), and longer flourishes and runs, plus some highly tasty organ licks and rolling Clavinet vamps. An excellent place to explore the power of MIDI Samples... from the people who invented the concept. "If you only buy one MIDI File disk, buy this!" The Mix. "A very worthwhile, innovative, invaluable and particularly twiddly addition to any MIDI file programmers collection." Future Music. "With so much emphasis on sample loops and hard disk recording, it's great to see emergence of an excellent musical aid aimed at sequencer artists." Keyboard Magazine.